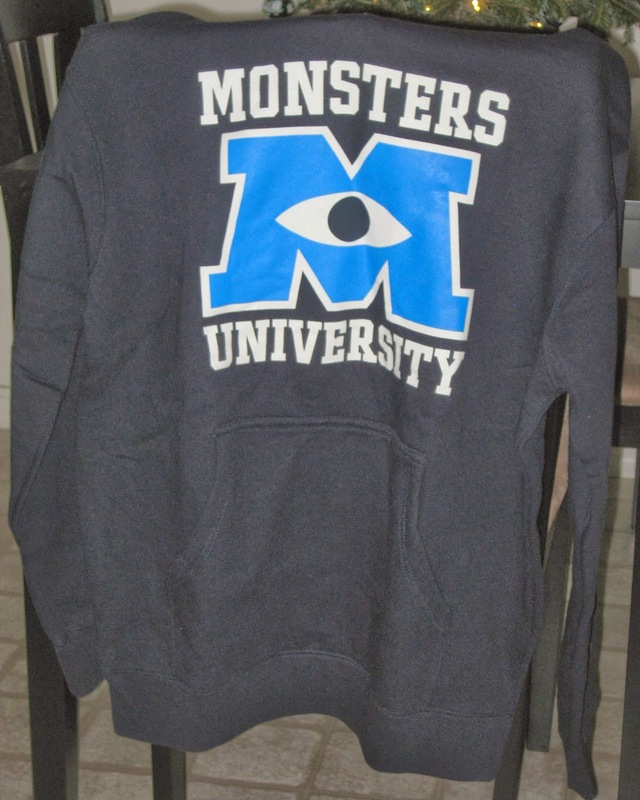 Here's another great item that was released as part of the Monsters University marketing campaign! About eight months before the film's release (and before we knew hardly anything about the film), Pixar created a "school website" that acted as though MU was a real school. 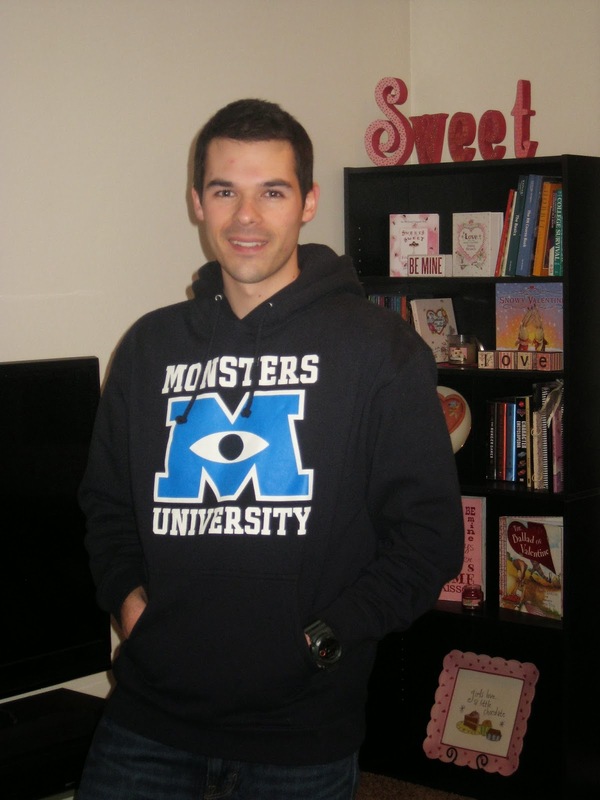 This sweatshirt/hoodie was available at the "MU Store" section of the site where you could find lots of typical college store type items such as shirts, pennants, mugs, hats, etc. This was then also available at the DisneyStore.com a little bit later. It has since sold out at the Disney Store but the MU Store seems to still have it in stock...and on sale! Definitely head on over there if you're interested. If you're a fan of MU and want to show off your "school pride", this is for you! As always, it's really well made and comfortable. No complaints about the quality here! I love the simple design and I'm so happy I finally had a chance to get this. A big thanks to my Grandad since this was a Christmas present from him! I really appreciate it. Have any questions? Just let me know! Shoot them off in the comments below or send me an email. Thanks so much for stopping by and be sure to check back daily for more items from my Pixar collection! dullest Cars run ever. The shelves were still almost completely bare. Wow, I can see it being blue now that I'm looking at the full-size photos on my computer (I was on my iPhone before). It's still crazy that it's a different color than mine though. Yeah, the shelves were pretty boring during my run as well - nothing new at all! Let me know how the picketing goes! :) Ha! Love the sweatshirt! We didn't end up getting any sweatshirts when they had the "student store" on the web site, but we did pick up MU tees and even a baby onesie for our daughter. These were really fun products, hats off to the marketing team! We are actually meeting our friends for lunch at Pixar this upcoming week and I'm hoping I can find some cute sweatshirts in the gift shop! Thanks you! Yah I really love the sweatshirt. I feel like I'm always throwing it on when I'm cold, which is pretty much every day here! I didn't get any of the "student store" tees (I should have) but did get the green Disney Store Oozma Kappa frat shirt. If we had a baby, I would have totally gone for the onesie, ha! Hi Dan. Ha! Yes, my name is Tiffany. Sorry, for some reason I thought my name showed up here, or else I would have "introduced" myself. Our friend works in the digital assets department at Pixar and he and his wife were really sweet to give our family a tour a couple years ago and we had so much fun! Of course when they invited us back for lunch we had to say yes! The campus is beautiful and they are just the sweetest people so we are looking forward to the visit and getting to see the studio store! Last time it was closed because it was a weekend, so it will be nice to finally get to shop in there! Where do you and your wife live? I'm guessing outside of California since you said it's always cold! :) And yes, I'll fill you in on what we find...I'm sure paying studio prices beats the ebay prices any day! Fantastic! That'll be so fun. What day this week are you going? By the way...your family looks awesome! Really fun tweets :) my wife and I live in rexburg ID right now while I finish up some school but we're from CT and will head back there as soon as I'm done. Can't wait to hear from you about your time! Hi Dan! We actually went today and oh my goodness, it was incredible! Our friends that work there are just the most gracious people, they make the trip extra fun! Lunch was wonderful and the gift shop is amazing!!! I'm not sure I could write every detail here, but feel free to send an email over and we can chat! Thanks for the sweet comment on our family, what are you studying in school? As far as school goes, I'm a communications/video production major.